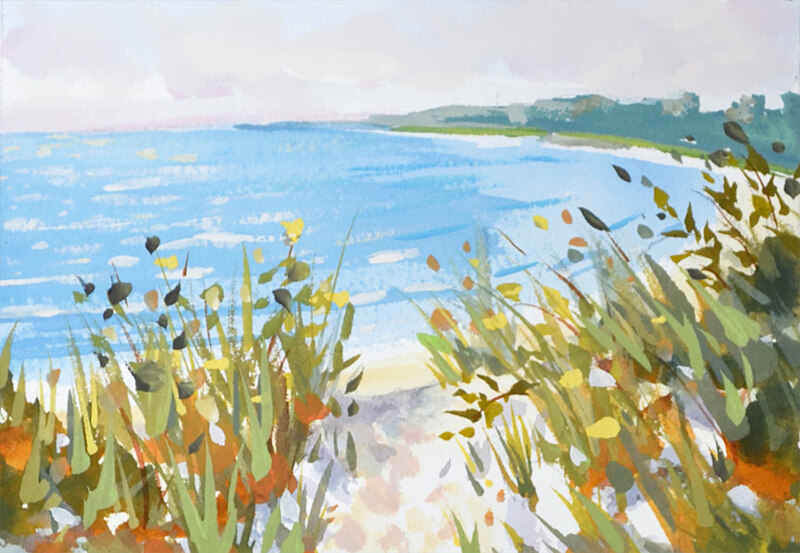 I spent an afternoon painting on location at Harkness Park in Waterford, CT. Plein air painting can be rewarding but it can have it’s drawbacks. I wasn’t planning on painting too long unless I found shade to setup. This seascape was so nice I stood in the hot sun to capture this beach path view scene. I often start with watercolor paint when I plan on using the opaque gouache paint. Sometimes I leave areas of the transparent layers to contrast with the thicker opaque layers, this can add nice depth to a painting. Leave areas untouched of transparent paint underneath the heavier opaque brushstrokes. This can create depth and interest to a painting. Artist Notes: View purchase info on the Shop Page. This painting is an original work of art by PJ Cook. Gouache paint on paper in a 5″x 7″ size. Sold unframed and can be easily framed with a ready-made picture frame. Professional materials used throughout. Signed by the artist front and back. All purchased artwork is carefully wrapped and packaged for shipping. Most artwork is shipped one day after payment unless otherwise stated. There is a full refund within 14 days of purchase. Thank you for your interest in my original art and please contact me with any questions. PreviousMake an Offer Cape Cod Lighthouse Original!